In June 2011 I was part of the TechField Day #6 delegation and one of the companies we visited was VKernel. During the VKernel presentation we, the delegates, had a number of comments on the layout / GUI part of vOPS. Only a few months later, VKernel shows they have been using our feedback and of their customers and made some pretty good adjustments to the GUI with the release of VKernel vOPS 4. Of course that is not the only change in vOPS 4. One of the biggest new features is that VKernel vOPS is now “Hypervisor Agnostic”, which specifically means that besides VMware vSphere, they now also support Microsoft Hyper-V and will be supporting RHEV in Q4 2011. VKernel vOPS 4 is not only Hypervisor agnostic in a way that it retrieves performance data from both VMware vSphere and HyperV, but the VKernel appliance can of course also be deploy as VMDK and VHD file. A considerable change in the GUI is the instant drill-down to VM level from a high level view. This high level view shows you the health of all your VMs in one glimps. Each VM is represented by a single square, the more VMs the smaller the squares get. Even with 2000 VMs you can still get a fairly good indication of your complete environment within seconds. 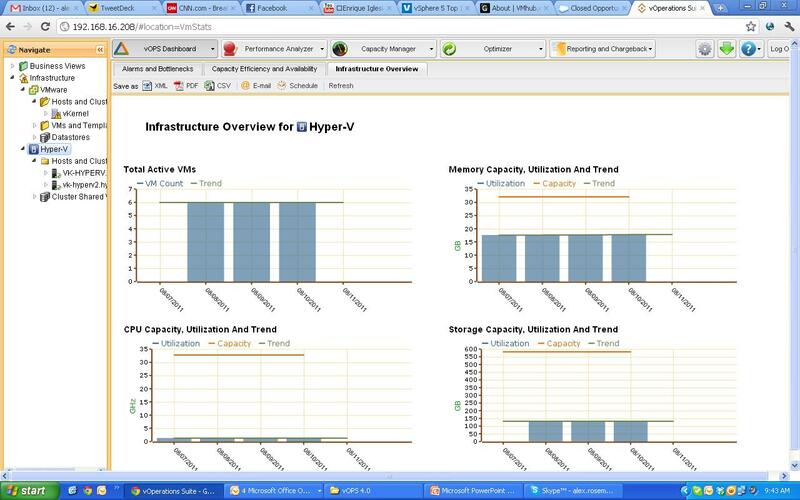 VMs in good health are green, VMs with a slight problem are yellow and if things are really bad…. You guessed it, the square that represents the VM turns red. Except for performance, it is also important to know if you are using your resources in a cost effective way. VKernel came up with a new feature called Cost Optimization. 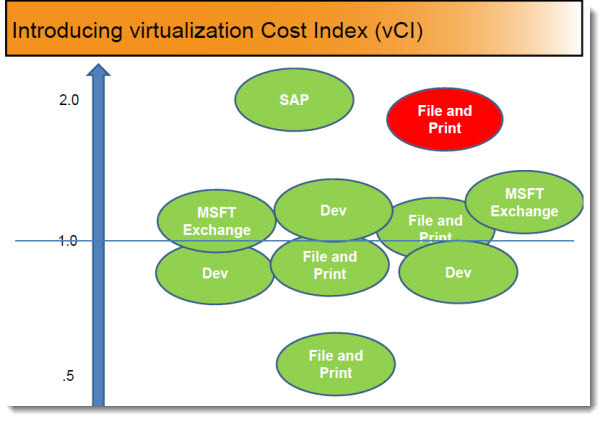 By using a cost index per VM, vOPS 4 can tell you if your VM is being used cost effectively. The index is calculated based on hardware costs, resource usage and VM density. When talking about this with Bryan Semple (CMO VKernel) I had my doubts about the calculations made. Using the VKernel cost index, a VM using a lot of resources on very expensive hardware, would get ‘punished’ for using these resources on an expensive host. Is that fair? An expensive host often has the most power, fastest RAM, etc and maybe you should run the more resource intensive VMs on the more expensive hosts. But who is to blame if the VM is not running where it should be running? It isn’t the VMs fault. So maybe the index should be more host oriented instead of VM oriented. Bryan thinks I have a point there and he will discuss this with the development team. performance, VMware hyper-v, operations, rhev techfield, tfd, vkernel, VMware, vOps, vsphere. permalink.